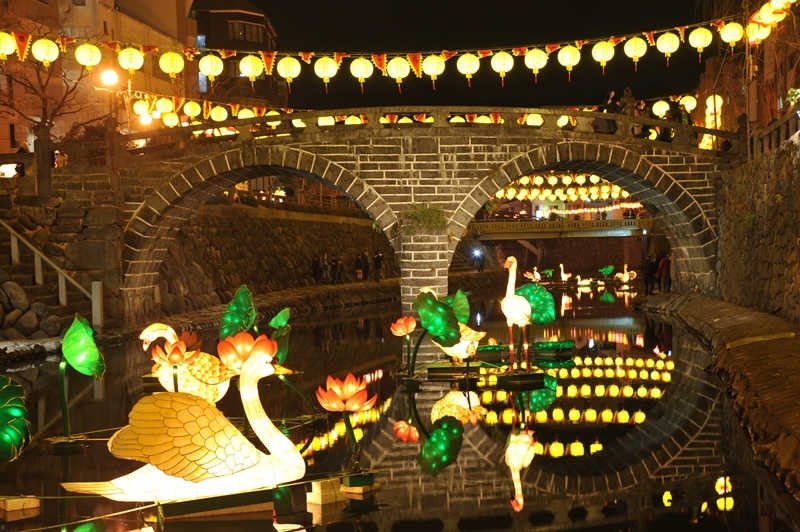 The 2014 Nagasaki Lantern Festival, Nagasaki Prefecture, is a picturesque Chinese event featuring 15,000 lanterns in the shape of various creatures along the streets lit up daily during the festival period. Chinese dragon dances and some other performing arts are daily demonstrated at Minato Koen Park, Chuo Koen Park, Kofukuji Temple and other sites. Kotei-gyoretsu (a parade of Chinese emperor) marches from Chuo Koen to Minato Koen (park) from 2 p.m. to 4:30 p.m. on the 1st and the 8th. Maso-gyoretsu (a parade of the goddess of voyage) starts from Koshi-byo to Kofukuji Temple from 2 p.m. to 5:20 p.m. on the 2nd, and from Kofukuji Temple to Koshi-byo from 2 p.m. to 5:20 p.m. on 9th. Many other events are scheduled during the festival period. Access: (1) Minato Koen (park): By street car from Nagasaki Station to Tsukicho Station and then walk three minutes. (2) Chuo Koen (park): Six minutes by bus from JR Sasebo Station to Matsuura Bus Stop, and then walk three minutes. (3) Kofukuji Temple: Five minutes by street car bound for Hotaru-chaya from Nagasaki Station and get off at Kokaido-mae Station, and then walk five minutes.